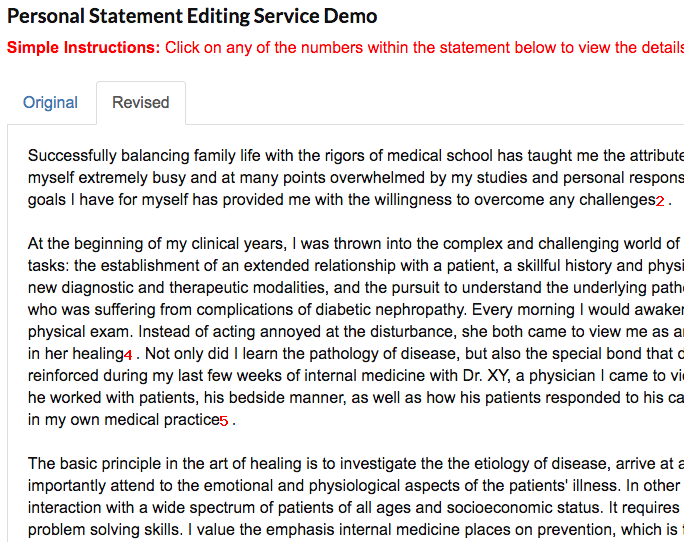 The Residency Statement Editing Service (S-ES) sets the standard for all medical residency Personal Statement editing services. Not content to simply glance over your Personal Statement and offer shallow suggestions, our Editors are trained to take a deeper dive into the depths of your Personal Statement. If you are worried your current Personal Statement is not at the right level of quality to give you a competitive edge during the Residency Application Season, submit your Personal Statement and watch as your Editor transforms your draft by correcting grammatical errors, smoothing over rough language, fine tuning the format, and much more. Follow the S-WS’ simple 4-step procedure to put together your Personal Statement. You’re in control of your Personal Statement’s destiny with the use of the Action Summary. By Accepting or Denying the Actions suggested by your Editor, you contribute to shaping the Personal Statement to get you into residency. Not only will your Editor's Actions be broken down and laid out for you, your Editor will also include a personal summary of their work with a detailed description and feedback about your Personal Statement. Have any questions or concerns during the Editing process? Leave a message for your Editor at any time on our in-house messaging system and they will answer as soon as they can. Start the Editing process by entering your full name, the intended specialty focus of your Personal Statement and any additional information you want your Editor to know. Paste your existing Personal Statement text into the S-ES system and submit. You will be assigned a personal Residency Statement professional Editor to work with you throughout the process. Your Editor will analyze your Personal Statement through a strict and thorough process, and comb through the text, making suggestions and asking for additional vital information as needed. Your first copy will be returned complete with a full Editor Summary, and revised text with actions for you to review. You will have the option to look over the edited Personal Statement, Accept or Deny the Editor’s Actions, ask any questions, and make any comments. A completed final copy will be provided for your use throughout the Residency Match Season. Why choose the Editing Service (S-ES)? If you have a pre-existing Personal Statement you would like to revisit, revise, or refine, the Editing Service (S-ES) is for you. How long does the Editing Service take? The total processing time for the Editing Service is 3 to 5 days. You may select the Expedite Option to reduce the processing time to 24 to 48 hours if you need your Personal Statement right away. Can I submit an outline or my thought process? No, the Personal Statement you provide must be structured in paragraph form. Our Editors will work with you to edit the statement, however, the S-ES service cannot re-write your Personal Statement. See S-WS for complete drafting services. Can I remove a section of the text and have my Editor write a whole new section? No. For more in-depth Personal Statement work, please see the S-WS Writing Service page. Is there a size limit for my submitted Personal Statement? Yes, your Personal Statement must be less than 1,000 words in order to submit.